Welcome to USA Hockey-MeiGray Group's NTDP Under-18 Team ‘98 Throwback Salute To Heroes Game-Worn Jersey Auction. USA Hockey's National Team Development Program, based in Ann Arbor, MI, is a full-time development program to prepare student-athletes under the age of 18 for participation on U.S. National Teams and success in their future hockey careers. The U.S. National Under-18 Team, part of USA Hockey's National Team Development Program, plays a full schedule that includes games against United States Hockey League foes, NCAA Division I and III opponents, and three international games. On March 22 and March 23, 2019, the Under-18 Team took to the ice wearing unique ‘98 Throwback Salute To Heroes Game-Worn Jerseys while facing the Des Moines Buccaneers at USA Hockey Arena in Plymouth, Michigan. Team USA defeated the Buccaneers, 7-3, on March 22, and 7-4 on March 23. 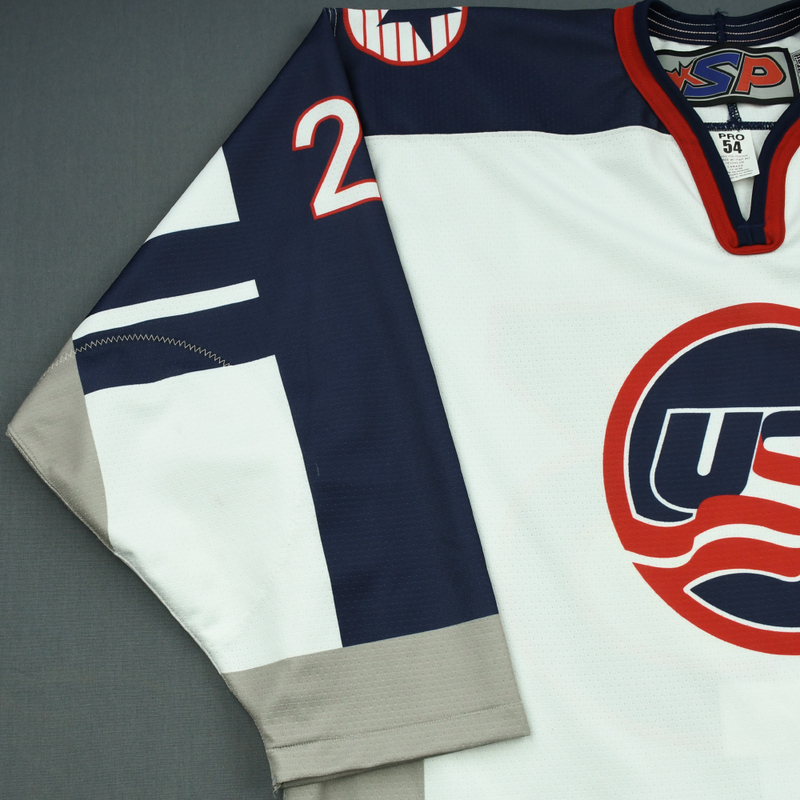 One set of ‘98 Throwback Salute To Heroes Game-Worn Jerseys were produced and worn in the two games. There are 22 game-worn jerseys up for bid. The jerseys are manufactured by SP Apparel. 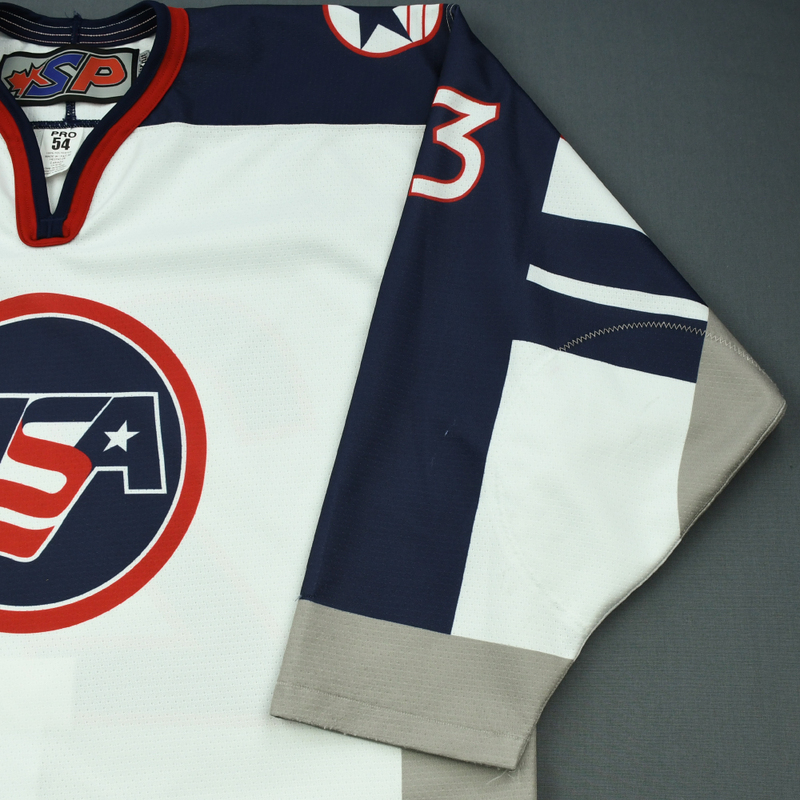 The set of jerseys was collected after the games by Team USA's equipment staff. Each jersey offered in auction has been security-tagged with an individually serial-numbered USA Hockey-MeiGray Authentication Program inventory tag. This auction is for the actual ‘98 Throwback Salute To Heroes Game-Worn Jersey worn by #23, Domenick Fensore on March 22 and 23. Fensore signed this jersey after the second game. Fensore recorded two assists on March 23. 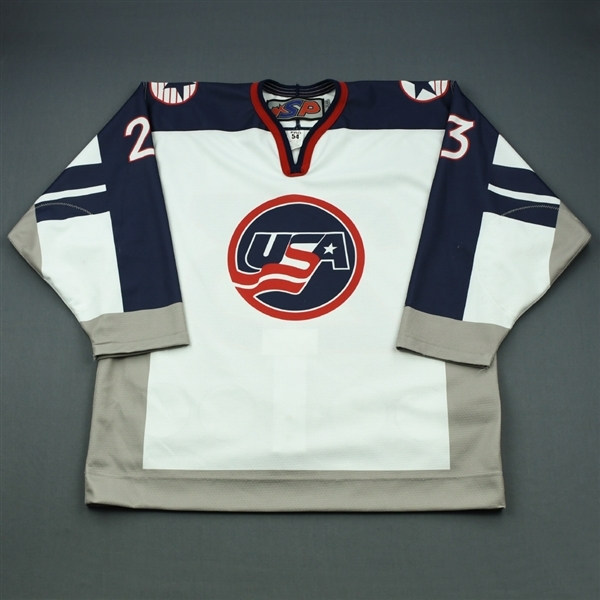 This white jersey, a Size 54, has been registered in the USA Hockey-MeiGray Game-Worn Authentication Program as number USA02238. Proceeds will benefit the Michigan Region 9 Veterans Community Action Team, a non-profit organization that assists veterans in need. The MeiGray Group is the world's leading authenticator of, and source for, game-worn hockey jerseys. The Branchburg, N.J., company is partners with 8 of the 31 NHL teams, and the ECHL. MeiGray has authenticated and sold nearly 100,000 game-worn jerseys since it was founded in 1997. MeiGray has also partnered with the National Basketball Association since 2006.